The Richmond Heights City Council Tuesday night gave a formal first reading to a rezoning request and development plan for a proposed 203-unit, upscale apartment complex at the corner of Boland and Dale. 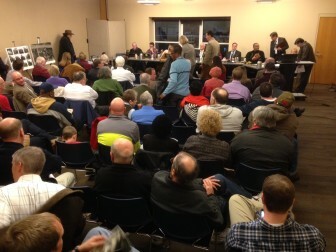 Residents and the city council gather for the meeting Tuesday evening. Developer Joe Cyr, who has developed more than $300 million in properties around St. Louis, told the council that the planned $34 million, four-story complex would be typical of a new breed of “class A” boutique apartment properties, designed to attract long-term, upper-income residents with amenities – such as a swimming pool, onsite parking, and a clubhouse with outside kitchen – as well as “Ritz Carlton”-grade services. However, the council, for the second time, heard more than 90 minutes of objections from residents who say the project is too large for the site, incompatible with surrounding single-family houses and would add to already growing traffic congestion. “To use an old county expression, it’s like a 10 lb. load in a 5 lb. bag” said long-time St. Louis-area development consultant Richard Ward, who was brought in by local residents to help explain their concerns. A show of hands indicated nearly all of the roughly 75 area residents at the meeting were opposed to the project, with only one speaking in favor of it. The council received a petition, with 125 signatures, opposing the development. 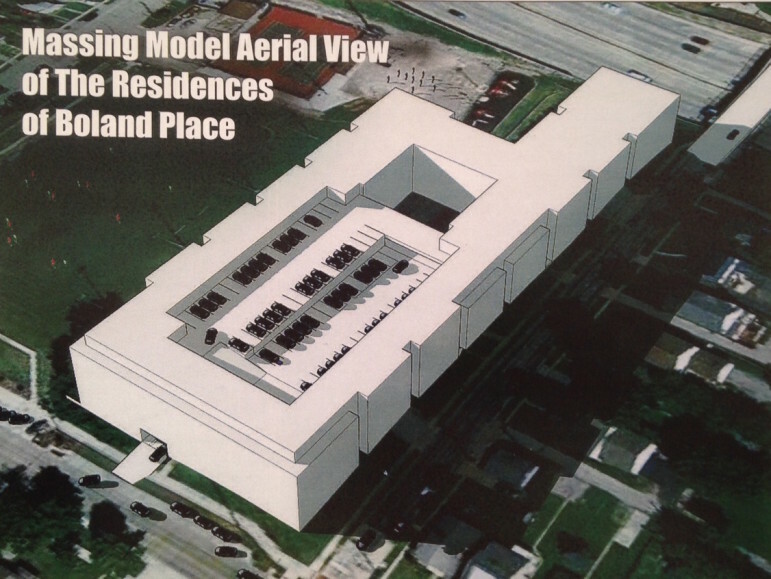 Opponents of the apartment complex handed out this illustration at the meeting. Mayor James Beck reported that attorney and former council member Paul Lore has filed a formal objection to the rezoning – from R-5 to Planned Development – requested for the project. However, Cyr contends the proposed Boland Place apartment complex will quickly become a valued asset for the community, noting a landmark change in the real estate market nationwide. For a variety of reasons, more Americans are now renters rather than homeowners, he told the council. The proposed complex is designed to attract a range of affluent, long-range tenants – including young upwardly-mobile college grads, busy mid-career professionals, and “empty nest” retirees – who are increasingly opting for the convenience and luxury of high quality apartment living with almost hotel-style services, Cyr said. Tenants in the nation’s new breed of boutique apartment developments benefit from on-site managers providing concierge-like services, such as accepting daytime parcel deliveries for tenants, according to Michelle Tate of the specialized Philadelphia management firm contracted to run the new complex. Other services include apartment-door-to-car-door snow removal and “predictive” maintenance that makes calls for repairs a rarity, she told the council. To ensure that caliber of service is maintained – and quality tenants are thereby retained – a minimum of 200 units is required, Cyr said, explaining the complex’s controversial high population density. However, some nearby residents fear the new complex could be part of a luxury apartment “bubble.” At least four new luxury apartment complexes are expected to open within roughly two miles of Boland Place over coming months, noted area resident Derek Bolden. The area could soon be oversaturated with more than 400 new apartment units, he asserted. That could set the stage for the financial failure of the Boland complex; forcing a sale to new owners or abandonment of the high-end market in favor of student housing or even government subsidized HUD housing for low income individuals, several area resident said. Cyr countered with marketing research indicating his new complex should be fully occupied in 13 to 24 months. He added that the philosophy behind his real estate development firm, ILI, LCC, is to develop and hold properties as long-term investment. “We are not … developers and flippers,” he said. Even if his firm was forced to sell, Boland Place would be quickly snapped up by a major institutional investor, such as a pension fund or insurance company, which would continue to maintain the building as a high-end complex in order to meet return on investment goals, Cyr said. Unlike most apartment buildings in the past, boutique apartment developments are considered “institutional” grade investments, suitable for institutional real estate investors that have traditionally financed mostly shopping centers, hotels, and large office buildings, Cyr said. At least two area residents asked the city hold off on development of the Dale and Bolden property until the condominium market picks up. Others called for conversion of the former A.B. Green School building to apartments, as has been done with numerous school buildings in the City of St. Louis. However, Cyr contends the Green School building, closed since 2004, has been repeatedly vandalized and is mold infested, making it unsuitable for redevelopment. Moreover, not being listed on the National Register of Historic Places, like many of the redeveloped St. Louis schools, the Green School building does not qualify for the tax credits necessary to make redevelopment feasible, Cyr said. Beyond the size of the proposed building — four stories tall and two football fields long — fears of traffic and parking problems continue to be perhaps the most common concerns cited by area residents. The complex’s four-level parking area would provide some 396 spaces, or 1.85 spaces per unit. That is below the 2.0 spaces generally required by the Richmond Heights building codes for such buildings, but still exceeding the 1.5 spaces required by St. Louis County, the 1.45 required by Clayton and the 1.23 to 1.38 required under nationally recognized industry standards, Cyr said. A traffic study commissioned by the developer projects building residents would make 1,335 car trips per day, not noticeably affecting traffic counts on nearby street. However, residents contend the study does not realistically reflect the impact the complex would have on traffic patterns. Lore asked the council to consider the effect of 300 cars, leaving the apartment complex during “the 8 a.m. rush,” would have on Dale Avenue traffic. Moreover, the increased traffic from the apartment complex must be considered along with the impact of increasing traffic spillover from Hanley Road onto residential streets, several speakers suggested. Comments on the apartment proposal were taken Tuesday during the second half of a two-part public hearing which began at the council’s Jan. 4 meeting. A second reading of the development and rezoning proposal is set for the council’s Feb. 1 meeting. In other action Tuesday, the council approved issuance for a liquor license to WGR Saint Louis for its new Weber Grill, 1147 Saint Louis Galleria. When I envision this development, I think of the DeMun Pointe condo building on Clayton Road right across the street from St. Mary’s. It’s nice in that spot, but Clayton is a five lane, arterial road. The opposed homeowners are right. Putting that kind of structure on two-lane Dale Avenue and a side street like Boland is going to look strange. It’s just not to scale for the neighborhood. Thank you for your comment, Jane. I’d like to understand more about how people judge scale since many who oppose the development have said it is too large. Clearly, when something is far larger, it will look out of place, cast long shadows, etc. This would be the case if someone were to build a 20-story or even 10-story building along Dale. What is it about a fourth story that makes an apartment building too large? If the rule is proportional, that nothing should be built that is twice as tall as its neighbor (for instance), then why are all these two story houses erected next to ranches? There is a pair of handsome, very tall, connected duplexes on Lindbergh near Big Bend that stand next to a one story home. Does this aggravate people when they drive or walk by them? Do concerns of scale apply horizontally? Hypothetically, if the plot where Little Flower Church and School currently sits were covered with a few under utilized buildings, would people oppose building Little Flower Church and School there because it is too big–much bigger than the surrounding single family homes? Thank you for adding to the conversation and explaining your position. I believe this debate is healthy and good for our city. Yes, I would say the concern is as much horizontal as it is vertical. One building that covers that entire area from the corner to the highway is just so monolithic, even if it is “just” four stories. If, say, they took the existing A.B. Green and turned it into apartments or condos and built a complementary structure where the church is with a little more of a green space buffer around it, I wouldn’t have a problem with it. I think that sounds great, actually. But I’ve been forthright from the beginning on here that my problem is the tearing down of A.B. Green. No plan that includes that will get my support. My support is somewhat inconsequential, though, since I am a Maplewood resident. But I lived in Richmond Heights for over a decade and know that area well. Even though I pay taxes to a City Hall on Manchester and others pay taxes to a City Hall on Big Bend, we all live in the same community. I agree with the opposed residents that the building is too big for the space, regardless of my own desire to save the historic structure already there. Jane, thank you for your thoughtful and civil reply. You are certainly welcome to speak on this topic, regardless of your residency. There isn’t a citizen of either Maplewood or Richmond Heights that doesn’t have an interest in the neighboring town. I agree that the proposed structure is larger than we are accustomed to. Part of the reason for its length is to hide the parking from public view by massing it in the center of the complex. Had the parking been on the perimeter, the building would look smaller to passersby. However, swaths of asphalt and 100+ cars creates a worse eye-sore than the proposed building. A perimeter of parking would, I’d argue, be worse than the current eye-sore and would certainly do more to dilute the area’s residential presence. That relative loss is significant because of how unattractive the current buildings and lots are. What pedestrians and motorists now see along that patch of Dale are poorly maintained grounds, a perpetually empty parking lot, tree stumps, and brick signs posts holding no sign. Regarding Hadley, the damage had already been done so long ago by the developer(s) and the city of Richmond Heights that there wasn’t much for people to bemoan anymore. By the time the houses were torn down it was indeed a blighted neighborhood. In that sense, I wasn’t sad to see it go either, but would I prefer for the neighborhood before all the corporate machinations started to still be there? Absolutely. I am rarely, if ever, for the tearing down of a neighborhood full of well-built homes (and the Hadley ones were small but nice brick homes) to construct another characterless strip mall. I feel the same way about Maplewood Commons. Regarding Menards itself, I think RH made a mistake choosing Menards instead of Costco, even factoring the higher TIF Costco requested. Three home improvement stores? Come on. While similar to Sam’s, Costco does attract a slightly different clientele and wouldn’t have so directly cannabalized business like the ridiculous Home Depot/Menards/Lowes combination is going to do. Costco would have been a fantastic addition to this area, especially considering the closest one is 20+ minutes from here. Did you mean the shuttering of A.B Green? I agree with you about the scale. The location is prime. Would the developer consider negotiating the size of the complex and density of occupants so that there’s more of a balance for the neighborhood? I think Milk Toast is right that Matthew has a connection to the developer or vested interest in this project. If he lives in Richmond Heights or Maplewood, then he knows that we tend to be an inclusive bunch and have supported a lot of growth. Many of us do object when people’s homes are being torn down through eminent domain, or when they are being force fed poorly planned development in the name of progress. I am all for rentals, and we need more so that our families can stay in the school district, regardless of income level. I am not in favor of embracing a complex just because it houses wealthy people. Are they somehow better? I would rather have diversity, but in the greater St. Louis region, that usually goes away when you bring in affluence. If the mayor and city council can’t respect the wishes of the people living near this proposal, or people who have to travel Dale daily, then I question the interests they are following. It will be remembered at election time. By then, I suspect commenters like Matthew will be long gone. You must also think that Mr. Toast’s argumentative style is correct. Both of you have resorted to ad hominem attacks (an argument directed against a person rather than the position he/she are maintaining.) Your insistence that whoever disagrees with you must be getting a kick back from the developer is asinine. I never stated Richmond Heights was an exclusive bunch. (I am proud of our city for approving the Boys Hope Girls Hope youth home south of Menards.) My discussion of renters was prompted by the offense Mr. Toast took at Jeff’s earlier comment. My support of the complex has less to do with its target market (i.e., high-income earners) than with the fact that it is a real, fully-funded proposal. The previous proposals for the site have fallen through due to a lack of financing (and did not include the adjacent church property). The long-vacant school and under-utilized church complex add little to nothing to our city. Should there be a competing, viable proposal that had a less affluent target market or a smaller number of units, I would gladly consider supporting that instead. (I should note that many of the people opposed raised the specter of pubic housing, which indicates at least some people are less welcoming of the diversity you want to court.) There are no such proposals. For the record, I am a home owner and have lived in Richmond Heights for five years. I travel Dale daily. The only interest I have in this development is as a tax payer and citizen of the city in which it would be built. As evidence of my interest, I have voted in every local election and will continue to do so. I should add I’ve been reading this website almost daily since its inception. I followed Doug Miner back when he wrote for the since-defunct Patch website. You have taken the time to reply to nearly every person who opposes this development. I think it was reasonable to ask whether you represent the developer of this project or have a vested interest beyond being a resident. You accuse me of attacking those who don’t agree with me, but I really only questioned (not attacked) your interests in this issue. That was approximately one sentence in my response. The rest contained concerns, which you must have noticed because you responded to them. Also, if you truly believe that you have to define terms for people, think about not using them. I am trying to be open to your thinking, but your arrogance makes it hard. I am very concerned for the residents near this development, as I was incredibly concerned about Hadley Township from the very start of it’s slippery slope toward Menards. If you want to sway voters, being insulting won’t do it. I’m vocal in my position, but I also read what others say and am open to other viewpoints. You don’t help yourself by name calling. I re-read my comment to see if I called you a name, which I would have apologized for. I said your insistence I was in cahoots with the developer was asinine, not you yourself. I do respect everyone who has spoken out about this proposal, even though I find some of the statements less persuasive or appropriate than others. You are right, however. I did say “attack,” which is a stronger word than “argument.” Usually the stronger language is warranted by the fact that the argument is directed against the person–in this case myself–and not the position. Making insinuations about the person is more aggressive, but I could have used “ad hominem argument” instead. You’re right. I am sorry if this discouraged you from talking with me. It would have been reasonable to ask about my background. I didn’t see any questions marks within the first paragraph of your comment about me. You and Mr. Toast instead presumed I had monetary interests in the development rather than asked me what my interests were. As to using the term “ad hominem,” I meant no offense in defining the term. I put the definition in parentheses to spare someone reading the comment from taking a trip to a dictionary. (I am many years removed from logic courses, so I often times need a refresher myself.) I think it’s fair and even a good idea to educate people on common logical fallacies and their names so that we can identify sound arguments from unsound one. Arrogance, as I understand it, would be using uncommon words and not defining them in order to confuse the listener or make them feel dumb. I wasn’t doing either. Thank you for being open and for listening closely to what everyone has been saying on this story and elsewhere in our community about this development. I am sorry if my word-choice struck you as arrogant. I hope the clarification above is enough to smooth my comments over. Regardless, I believe we are both committed to our city and trying pursue its best interests. Although we disagree about what that best interest is in this instance, I hope we can work together on that common goal in the future–regardless of this apartment complex’s fate. Another “issue” that should be taken into consideration is the large number of rental apartments and duplexes already interspersed in the surrounding neighborhood. By adding such a large number of rental property options in a area that already has a large number of rental properties, you run the risk of leaving these older properties ensconced within these charming, walkable, bike-able, already established areas, without tenants. Then, owners have to lower their rental prices in order to keep their properties occupied. That could create a downward spiral of ever decreasing property upkeep of the buildings that are mingled in with the family owned homes. While the scenario you describe is possible, I’d caution you it is unlikely. As a demographic, renters are no more monolithic than home owners. Just as building $300k homes would not mean that $150k homes already for sale in the area would go unsold, so building an apartment complex with various amenities and leased at $1,500 a month would not mean the less expensive flats leased at $800 a month would be sit vacant. All of these price points are aimed at different types of people with different levels of income and wealth. The hate on this post’s comments is unreal. Wanting people to “die off”? If these are the kind of people who are going to live in that apartment building I’ll gladly take more tradition and regressive thinking please. Thus far, the “hate” is isolated to one comment, not including your own. I’d like to think the smiley face at the end of the remark you took offense at indicates the statement was tongue-in-cheek. I assume Jeff was speaking to one of the underlying tensions within this debate. The opposition’s wariness of renters does exacerbate an intergenerational feud. Millennials who entered the economy at a far worse point than the previous three generations have foregone home ownership out of necessity. Renting, in a location near public transportation, a library, and gym as this proposal is, would be attractive to the under 35 crowd who never amassed the savings requisite for a down payment on a mortgage. Opposing this development could be interpreted as a “Stay Out” to relatively young people not fortunate enough to be born into an economy where significant net assets early in one’s working life was the rule and not the exception. Your comment does little to elevate the conversation, either, Mr. Toast. It uses exaggerate language (“hate, “unreal”) and jumps to hasty conclusions (would be apartment-dwellers want others to die). Matthew I think you read into this what you wanted to. The chief complaint the existing residents have is the scale of the building not necessarily the building itself. I think you want to make more of this being an “intergenerational feud” to play into some sort of false narrative. Someone who is trying to be funny with an offensive comment like hoping that people “die off” needs to check in with a therapist. To illustrate how offensive that comment actually is, simply replace “generation of baby boomers” , with “bunch of Black people” or “group of Jews”. Even with a smiley face would that still seem cute to you? I do not condone that sort of humor. You’ll note I did not repeat it myself. I would rather promote civilized, thoughtful discussion, which my various comments have been an attempt at doing. I was simply offering a different interpretation of Jeff’s comment than the one you offered. We will not know for certain what he meant unless he responds to clarify why he said what he did. The narrative I offered is not false. (I also did not state it was my own, although that is the conclusion you drew.) In following this story and the meetings I’ve attended, I’ve heard numerous opposing parties make negative comments about renters. It’s important to bear in mind just who those renters are likely to be (in this case, members of a different generation than those opposing the development). I never stated the chief complaint against the development was the demographic it targets. Again, my response was to try and give a more charitable interpretation of Jeff’s comments and why some people would be opposed to the opposition, as it were. I understand that concerns of disproportionate scale are near the top of the list for reasons to oppose the development. I do not see that fact as being quite so problematic. The current crumbling structures are bigger than the surrounding homes. The current vacant parking lots are larger than the nearby driveways. The current nearby highway is wider than the surrounding roads. The house behind me is roughly twice as large, but I didn’t rally to prevent it from being built. Variety is the spice of life. Matthew I would just caution you that these are not abstract concepts. This discussion involves real people who live in homes many of which are a third of the size of this proposed development. You think that people are trying to exclude others, I disagree what I read and see are people who are holding on to the most valuable investments of their lives. Why don’t you chastise the developer for not being able to reduce the scale of his complex instead of criticizing folks for not wanting to live in shadows for half of the day? Your inability to see both sides of this argument calls into question your real motivations. You are probably working for the developer Joe Cyr. *I meant a third of the height. Thinking about it though I don’t know if that is accurate either. Mr. Toast, I assure you I see both sides. I have been following the debate closely from the beginning. Sometimes people who see both sides cast their votes differently than you do. It does not mean that citizens who disagree with you are secretly on an interested party’s payroll or otherwise acting in bad faith. I am not suggesting that everyone opposed to this development is primarily motivated by a desire to exclude others. They (like those in favor) have many motivations, some more reasonable than others. I can sympathize with people’s concerns over change and what it would be like to look at a different building across the street. Moreover, I admire the opposition’s organizational efforts and the regularity with which they have made their voices heard at meetings and elsewhere. I certainly support their right to do so and hope they maintain their interest in our city as a whole regardless of the outcome of this proposal. Nevertheless, if their concerns always were decisive in making public policy, we would never have built The Heights, Menards, or any other development (residential, commercial, or mixed-use) that abuts single family homes. Governing in a democracy involves taking into account the interests and well-being of all the citizens within the political body, not solely those who are the most immediately effected or who are the most vocal. I hope this is the decision-making process our elected official are currently in the midst of. Lastly, the developer did alter the visual appearance and size of the complex from its first renderings, setting back the top floor to alter its perceived height from a pedestrian’s line of sight. While the changes may not have been drastic enough to your liking, it’s reason enough not to chastise the developer. I’m sorry Matthew I care about my neighbors more than this development and any revenue it might bring in. Kuddos to my fellow neighbors, please fight on. I support you! For the sake of consistency, I do hope that none of the citizens opposing this project were among the 87% of Richmond Heights residents who stated on a recent survey that focusing on the “overall economic health of Richmond Heights” was either essential or very important. Our economic health is not improved by maintaining the status quo of abandoned buildings and dilapidated churches. This project is not too far from Brentwood Blvd. which is already slowed down with bumper to bumper traffic, causing drivers to find time saving short cuts by racing down our residential side streets. I do not see the connection between this project and the traffic you mention. Brentwood Boulevard is nearly two miles away from Boland Place. Anyone attempting to avoid Brentwood Boulevard via Boland Place does not understand the concept of a short cut. I am all for this 34 million dollar development.replacing a vacant and deteriorating school and a run down church. It will be a win for the school district and the parochial school down the street. “Not in my backyard!” Ashamed of my fellow Richmond Heights citizens. Typical backwards, STL county, regressive thinking. Like the one candidate said, “more tradition and less progress”. While I’m in favor of the apartment building, the City is not doing enough to mitigate the concerns over increased area traffic. One way to keep the feel of the neighborhood, could be to add an additional tax on the apartment owners to be used to revamp the area streets, make them more walking/biking friendly by enlarging the sidewalk, putting up medians filled with trees, dedicated bike lanes, and provide a bus stop right outside of the apartment building. If you’re really trying to attract “young upwardly-mobile college grads, busy mid-career professionals, and “empty nest” retirees”, these groups generally want walkable communities. Actually, medians in the road typically translate into faster traffic which would take away from the walkability/bikeability of the streets. While I agree with a lot of what you stated, I don’t believe the city needs to mitigate this “traffic” concern much further. Dale was just redone (costing a large chunk of money) making the street layout more bikeable/walkable. While the renovation doesn’t include some of the nice additions like a median or dedicated bike lane, it doesn’t require these to be successful. Dale is a wide road with one lane in each direction with limited car use. It is comparable to Bellevue Ave. There just isn’t enough traffic in the area to warrant more work on the streets or placing an unnecessary tax on a few apartment residents. The issue to making this area more attractable to those you mentioned is not the street layout, but the need to increase the number of places worth walking to (having the Heights, the RH library, and metro is a really good start). Hi Bob. Great piece and very fair. One small correction though, the actual number I stated was over 2000 new “luxury” units with nearly a 1000 (965) new units in Richmond Heights alone. Many thanks to you and Doug for your continued reporting of this situation it is very much appreciated.